Today, at the AWS Summit in Tokyo we announced a number of updates and new features for Amazon SageMaker. Starting today, SageMaker is available in Asia Pacific (Tokyo)! SageMaker also now supports CloudFormation. A new machine learning framework, Chainer, is now available in the SageMaker Python SDK, in addition to MXNet and Tensorflow. Finally, support for running Chainer models on several devices was added to AWS Greengrass Machine Learning. Chainer is a popular, flexible, and intuitive deep learning framework. Chainer networks work on a “Define-by-Run” scheme, where the network topology is defined dynamically via forward computation. This is in contrast to many other frameworks which work on a “Define-and-Run” scheme where the topology of the network is defined separately from the data. A lot of developers enjoy the Chainer scheme since it allows them to write their networks with native python constructs and tools. Luckily, using Chainer with SageMaker is just as easy as using a TensorFlow or MXNet estimator. In fact, it might even be a bit easier since it’s likely you can take your existing scripts and use them to train on SageMaker with very few modifications. With TensorFlow or MXNet users have to implement a train function with a particular signature. With Chainer your scripts can be a little bit more portable as you can simply read from a few environment variables like SM_MODEL_DIR, SM_NUM_GPUS, and others. We can wrap our existing script in a if __name__ == '__main__': guard and invoke it locally or on sagemaker. # hyperparameters sent by the client are passed as command-line arguments to the script. # ... load from args.train and args.test, train a model, write model to args.model_dir. Then, we can run that script locally or use the SageMaker Python SDK to launch it on some GPU instances in SageMaker. The hyperparameters will get passed in to the script as CLI commands and the environment variables above will be autopopulated. When we call fit the input channels we pass will be populated in the SM_CHANNEL_* environment variables. Now, instead of bringing your own docker container for training and hosting with Chainer, you can just maintain your script. You can see the full sagemaker-chainer-containers on github. One of my favorite features of the new container is built-in chainermn for easy multi-node distribution of your chainer training jobs. There’s a lot more documentation and information available in both the README and the example notebooks. AWS GreenGrass ML now includes a pre-built Chainer package for all devices powered by Intel Atom, NVIDIA Jetson, TX2, and Raspberry Pi. So, now GreenGrass ML provides pre-built packages for TensorFlow, Apache MXNet, and Chainer! 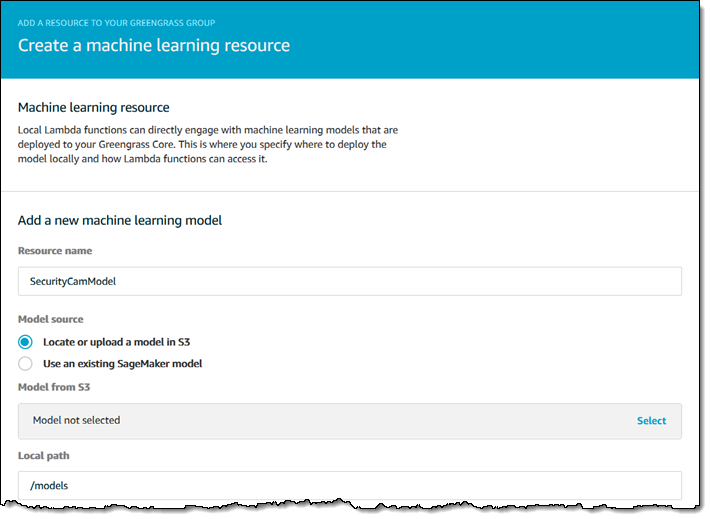 You can train your models on SageMaker then easily deploy it to any GreenGrass-enabled device using GreenGrass ML. I want to give a quick shout out to all of our wonderful and inspirational friends in the JAWS UG who attended the AWS Summit in Tokyo today. I’ve very much enjoyed seeing your pictures of the summit. Thanks for making Japan an amazing place for AWS developers! I can’t wait to visit again and meet with all of you. What happens when you combine the Internet of Things, Machine Learning, and Edge Computing? Before I tell you, let’s review each one and discuss what AWS has to offer. Internet of Things (IoT) – Devices that connect the physical world and the digital one. The devices, often equipped with one or more types of sensors, can be found in factories, vehicles, mines, fields, homes, and so forth. Important AWS services include AWS IoT Core, AWS IoT Analytics, AWS IoT Device Management, and Amazon FreeRTOS, along with others that you can find on the AWS IoT page. Machine Learning (ML) – Systems that can be trained using an at-scale dataset and statistical algorithms, and used to make inferences from fresh data. At Amazon we use machine learning to drive the recommendations that you see when you shop, to optimize the paths in our fulfillment centers, fly drones, and much more. We support leading open source machine learning frameworks such as TensorFlow and MXNet, and make ML accessible and easy to use through Amazon SageMaker. We also provide Amazon Rekognition for images and for video, Amazon Lex for chatbots, and a wide array of language services for text analysis, translation, speech recognition, and text to speech. Edge Computing – The power to have compute resources and decision-making capabilities in disparate locations, often with intermittent or no connectivity to the cloud. AWS Greengrass builds on AWS IoT, giving you the ability to run Lambda functions and keep device state in sync even when not connected to the Internet. Today I would like to toss all three of these important new technologies into a blender! You can now perform Machine Learning inference at the edge using AWS Greengrass. This allows you to use the power of the AWS cloud (including fast, powerful instances equipped with GPUs) to build, train, and test your ML models before deploying them to small, low-powered, intermittently-connected IoT devices running in those factories, vehicles, mines, fields, and homes that I mentioned. Precision Farming – With an ever-growing world population and unpredictable weather that can affect crop yields, the opportunity to use technology to increase yields is immense. Intelligent devices that are literally in the field can process images of soil, plants, pests, and crops, taking local corrective action and sending status reports to the cloud. Physical Security – Smart devices (including the AWS DeepLens) can process images and scenes locally, looking for objects, watching for changes, and even detecting faces. When something of interest or concern arises, the device can pass the image or the video to the cloud and use Amazon Rekognition to take a closer look. Industrial Maintenance – Smart, local monitoring can increase operational efficiency and reduce unplanned downtime. The monitors can run inference operations on power consumption, noise levels, and vibration to flag anomalies, predict failures, detect faulty equipment. Machine Learning Models – Precompiled TensorFlow and MXNet libraries, optimized for production use on the NVIDIA Jetson TX2 and Intel Atom devices, and development use on 32-bit Raspberry Pi devices. The optimized libraries can take advantage of GPU and FPGA hardware accelerators at the edge in order to provide fast, local inferences. Model Building and Training – The ability to use Amazon SageMaker and other cloud-based ML tools to build, train, and test your models before deploying them to your IoT devices. To learn more about SageMaker, read Amazon SageMaker – Accelerated Machine Learning. These new features are available now and you can start using them today! To learn more read Perform Machine Learning Inference. Amazon SageMaker continues to iterate quickly and release new features on behalf of customers. Starting today, SageMaker adds support for many new instance types, local testing with the SDK, and Apache MXNet 1.1.0 and Tensorflow 1.6.0. Let’s take a quick look at each of these updates. Amazon SageMaker customers now have additional options for right-sizing their workloads for notebooks, training, and hosting. Notebook instances now support almost all T2, M4, P2, and P3 instance types with the exception of t2.micro, t2.small, and m4.large instances. Model training now supports nearly all M4, M5, C4, C5, P2, and P3 instances with the exception of m4.large, c4.large, and c5.large instances. Finally, model hosting now supports nearly all T2, M4, M5, C4, C5, P2, and P3 instances with the exception of m4.large instances. Many customers can take advantage of the newest P3, C5, and M5 instances to get the best price/performance for their workloads. Customers also take advantage of the burstable compute model on T2 instances for endpoints or notebooks that are used less frequently. Today Amazon SageMaker has open sourced the MXNet and Tensorflow deep learning containers that power the MXNet and Tensorflow estimators in the SageMaker SDK. The ability to write Python scripts that conform to simple interface is still one of my favorite SageMaker features and now those containers can be additionally customized to include any additional libraries. You can download these containers locally to iterate and experiment which can accelerate your debugging cycle. When you’re ready go from local testing to production training and hosting you just change one line of code. These containers launch with support for Tensorflow 1.6.0 and MXNet 1.1.0 as well. Tensorflow has a number of new 1.6.0 features including support for CUDA 9.0, cuDNN 7, and AVX instructions which allows for significant speedups in many training applications. MXNet 1.1.0 adds a number of new features including a Text API mxnet.text with support for text processing, indexing, glossaries, and more. Two of the really cool pre-trained embeddings included are GloVe and fastText. All of the features mentioned above are available today. As always please let us know on Twitter or in the comments below if you have any questions or if you’re building something interesting. Now, if you’ll excuse me I’m going to go experiment with some of those new MXNet APIs! Can you believe it’s already the month of March? With some great new Tech Talks available this month, there’s no better time to grow your knowledge about AWS services and solutions. Below is the full schedule for the live, online technical sessions being held during the month of March. Make sure to register ahead of time so you won’t miss out on these free talks conducted by AWS subject matter experts. March 21, 2018 | 09:00 AM – 09:45 AM PT – Amazon Elasticsearch Service Deep Dive (300) – Learn how to run Elasticsearch using Amazon Elasticsearch Service. March 28, 2018 | 11:00 AM – 12:00 PM PT – Deep Dive on Amazon Athena (300) – Dive deep into the most common Amazon Athena use cases, including working with other AWS services. March 26, 2018 | 01:00 PM – 01:45 PM PT – High Performance Computing in the Cloud (200) – Learn how AWS is enabling faster time to results and higher ROI when it comes to solving the big problems in science, engineering and business with high performance computing in the cloud. March 27, 2018 | 01:00 PM – 01:45 PM PT – Introduction to Hybrid Cloud on AWS (200) – Learn how AWS is building the industry’s broadest capabilities for Hybrid Cloud deployments. March 19, 2018 | 01:00 PM – 01:45 PM PT – Running Kubernetes with Amazon EKS (200) – Learn about how Amazon EKS makes it easy to run and scale Kubernetes in the cloud. March 21, 2018 | 11:00 AM – 11:45 AM PT – Best Practices for Migrating Oracle Databases to the Cloud (200) – Learn best practices for migrating your Oracle databases to the cloud. March 21, 2018 | 01:00 PM – 01:45 PM PT – Life of a Code Change to a Tier 1 Service (200) – Come follow the journey of an AWS code change on its way to production. March 26, 2018 | 11:00 AM – 11:45 AM PT – Improve Efficiency by Migrating Messaging to Amazon MQ (200) – Learn how Amazon MQ makes it easy for enterprises, like GE, to save time and money by migrating to a managed message broker. March 22, 2018 | 11:00 AM – 12:00 PM PT – Learn Step by Step How iDevices Uses AWS IoT Analytics (300) – Learn how iDevices, with AWS IoT Analytics, built an anomaly system and gains deep insights into user behavior. March 20, 2018 | 01:00 PM – 01:45 PM PT – Working with Scalable Machine Learning Algorithms in Amazon SageMaker (400) – Get an introduction the collection of distributed streaming machine learning algorithms that come with Amazon SageMaker. March 22, 2018 | 01:00 PM – 01:45 PM PT – Enabling Deep Learning in IoT Applications with Apache MXNet (200) – Learn how to use deep learning in IoT apps using Apache MXNet. March 28, 2018 | 01:00 PM – 02:00 PM PT – Media Processing Workflows at High Velocity and Scale using AI and ML (200) – Hear how AWS customers have improved media supply chains using AI in areas such as metadata tagging (Rekognition and Comprehend), translations, transcriptions, and cloud services (Elemental). March 19, 2018 | 11:00 AM – 12:00 PM PT – Achieving Global Consistency Using AWS CloudFormation StackSets (300) – Learn how to centrally manage your accounts and regions using AWS CloudFormation StackSets. March 22, 2018 | 09:00 AM – 09:45 AM PT – New Mobile CLI and Console Experience (200) – Learn how AWS Mobile Services has introduced a new CLI and streamlined console experience in order to simplify and speed up the development of mobile applications with innovative AWS features and back-end functionality. March 28, 2018 | 09:00 AM – 09:45 AM PT – Deep Dive on New AWS Networking Features (300) – Learn how AWS PrivateLink, Direct Connect gateway, and new features with Elastic Load Balancers (ELB) come together to meet the needs of a modern enterprise. March 27, 2018 | 09:00 AM – 09:45 AM PT – The Evolution of Identity and Access Management on AWS (300) – Learn how identity federation can address many security and management scenarios as you expand your use of AWS. March 29, 2018 | 09:00 AM – 09:45 AM PT – Navigating GDPR Compliance on AWS (300) – Get a walkthrough of potential General Data Protection Regulation (GDPR) obligations and see how the AWS cloud offers services and features that are consistent with GDPR considerations in the ramp-up to the May 25th, 2018 enforcement date. March 20, 2018 | 11:00 AM – 11:45 AM PT – Operating Your Serverless API in Production at Scale (400) – Learn how to deploy, monitor, and manage serverless APIs in production. March 27, 2018 | 11:00 AM – 11:45 AM PT – Enterprise Applications with Amazon EFS (300) – Join us for a technical deep dive on Amazon EFS, where you’ll learn tips and tricks for integrating your enterprise applications with Amazon EFS. March 29, 2018 | 11:00 AM – 11:45 AM PT – Transforming Data Lakes with Amazon S3 Select & Amazon Glacier Select (300) – Join us for a webinar where we’ll demonstrate how Amazon S3 Select can increase analytics query performance up to 400%, and Amazon Glacier Select makes it practical to extend queries to archive storage, significantly reducing data lake storage costs. 1) MXNet is easier to use: The model server for MXNet is a new capability introduced by AWS, and it packages, runs, and serves deep learning models in seconds with just a few lines of code, making them accessible over the internet via an API endpoint and thus easy to integrate into applications. The 1.0 release also includes an advanced indexing capability that enables users to perform matrix operations in a more intuitive manner. Model Serving enables set up of an API endpoint for prediction: It saves developers time and effort by condensing the task of setting up an API endpoint for running and integrating prediction functionality into an application to just a few lines of code. It bridges the barrier between Python-based deep learning frameworks and production systems through a Docker container-based deployment model. Advanced indexing for array operations in MXNet: It is now more intuitive for developers to leverage the powerful array operations in MXNet. They can use the advanced indexing capability by leveraging existing knowledge of NumPy/SciPy arrays. For example, it supports MXNet NDArray and Numpy ndarray as index, e.g. (a[mx.nd.array([1,2], dtype = ‘int32’]). 2) MXNet is faster: The 1.0 release includes implementation of cutting-edge features that optimize the performance of training and inference. Gradient compression enables users to train models up to five times faster by reducing communication bandwidth between compute nodes without loss in convergence rate or accuracy. For speech recognition acoustic modeling like the Alexa voice, this feature can reduce network bandwidth by up to three orders of magnitude during training. With the support of NVIDIA Collective Communication Library (NCCL), users can train a model 20% faster on multi-GPU systems. Optimize network bandwidth with gradient compression: In distributed training, each machine must communicate frequently with others to update the weight-vectors and thereby collectively build a single model, leading to high network traffic. Gradient compression algorithm enables users to train models up to five times faster by compressing the model changes communicated by each instance. Optimize the training performance by taking advantage of NCCL: NCCL implements multi-GPU and multi-node collective communication primitives that are performance optimized for NVIDIA GPUs. NCCL provides communication routines that are optimized to achieve high bandwidth over interconnection between multi-GPUs. MXNet supports NCCL to train models about 20% faster on multi-GPU systems. 3) MXNet provides easy interoperability: MXNet now includes a tool for converting neural network code written with the Caffe framework to MXNet code, making it easier for users to take advantage of MXNet’s scalability and performance. Migrate Caffe models to MXNet: It is now possible to easily migrate Caffe code to MXNet, using the new source code translation tool for converting Caffe code to MXNet code. MXNet has helped developers and researchers make progress with everything from language translation to autonomous vehicles and behavioral biometric security. We are excited to see the broad base of users that are building production artificial intelligence applications powered by neural network models developed and trained with MXNet. For example, the autonomous driving company TuSimple recently piloted a self-driving truck on a 200-mile journey from Yuma, Arizona to San Diego, California using MXNet. This release also includes a full-featured and performance optimized version of the Gluon programming interface. The ease-of-use associated with it combined with the extensive set of tutorials has led significant adoption among developers new to deep learning. The flexibility of the interface has driven interest within the research community, especially in the natural language processing domain. Getting started with MXNet is simple. To learn more about the Gluon interface and deep learning, you can reference this comprehensive set of tutorials, which covers everything from an introduction to deep learning to how to implement cutting-edge neural network models. If you’re a contributor to a machine learning framework, check out the interface specs on GitHub. Leaves are crunching under my boots, Halloween is tomorrow, and pumpkin is having its annual moment in the sun – it’s fall everybody! And just in time to celebrate, we have whipped up a fresh batch of pumpkin spice Tech Talks. Grab your planner (Outlook calendar) and pencil these puppies in. This month we are covering re:Invent, serverless, and everything in between. Noted below are the upcoming scheduled live, online technical sessions being held during the month of November. Make sure to register ahead of time so you won’t miss out on these free talks conducted by AWS subject matter experts. Driven by customer demand and made possible by on-going advances in the state-of-the-art, we’ve come a long way since the original m1.small instance that we launched in 2006, with instances that are emphasize compute power, burstable performance, memory size, local storage, and accelerated computing. Today we are making the next generation of GPU-powered EC2 instances available in four AWS regions. Powered by up to eight NVIDIA Tesla V100 GPUs, the P3 instances are designed to handle compute-intensive machine learning, deep learning, computational fluid dynamics, computational finance, seismic analysis, molecular modeling, and genomics workloads. Each of the NVIDIA GPUs is packed with 5,120 CUDA cores and another 640 Tensor cores and can deliver up to 125 TFLOPS of mixed-precision floating point, 15.7 TFLOPS of single-precision floating point, and 7.8 TFLOPS of double-precision floating point. On the two larger sizes, the GPUs are connected together via NVIDIA NVLink 2.0 running at a total data rate of up to 300 GBps. This allows the GPUs to exchange intermediate results and other data at high speed, without having to move it through the CPU or the PCI-Express fabric. This operation is in the innermost loop of the training process for a deep neural network, and is an excellent example of how today’s NVIDIA GPU hardware is purpose-built to address a very specific market need. By the way, the mixed-precision qualifier on the Tensor core performance means that it is flexible enough to work with with a combination of 16-bit and 32-bit floating point values. I always like to put raw performance numbers into a real-world perspective so that they are easier to relate to and (hopefully) more meaningful. This turned out to be surprisingly difficult, given that the eight NVIDIA Tesla V100 GPUs on a single p3.16xlarge can do 125 trillion single-precision floating point multiplications per second. Let’s go back to the dawn of the microprocessor era, and consider the Intel 8080A chip that powered the MITS Altair that I bought in the summer of 1977. With a 2 MHz clock, it was able to do about 832 multiplications per second (I used this data and corrected it for the faster clock speed). The p3.16xlarge is roughly 150 billion times faster. However, just 1.2 billion seconds have gone by since that summer. In other words, I can do 100x more calculations today in one second than my Altair could have done in the last 40 years! What about the innovative 8087 math coprocessor that was an optional accessory for the IBM PC that was announced in the summer of 1981? With a 5 MHz clock and purpose-built hardware, it was able to do about 52,632 multiplications per second. 1.14 billion seconds have elapsed since then, p3.16xlarge is 2.37 billion times faster, so the poor little PC would be barely halfway through a calculation that would run for 1 second today. Ok, how about a Cray-1? First delivered in 1976, this supercomputer was able to perform vector operations at 160 MFLOPS, making the p3.x16xlarge 781,000 times faster. It could have iterated on some interesting problem 1500 times over the years since it was introduced. Comparisons between the P3 and today’s scale-out supercomputers are harder to make, given that you can think of the P3 as a step-and-repeat component of a supercomputer that you can launch on as as-needed basis. In order to take full advantage of the NVIDIA Tesla V100 GPUs and the Tensor cores, you will need to use CUDA 9 and cuDNN7. These drivers and libraries have already been added to the newest versions of the Windows AMIs and will be included in an updated Amazon Linux AMI that is scheduled for release on November 7th. New packages are already available in our repos if you want to to install them on your existing Amazon Linux AMI. The newest AWS Deep Learning AMIs come preinstalled with the latest releases of Apache MxNet, Caffe2, and Tensorflow (each with support for the NVIDIA Tesla V100 GPUs), and will be updated to support P3 instances with other machine learning frameworks such as Microsoft Cognitive Toolkit and PyTorch as soon as these frameworks release support for the NVIDIA Tesla V100 GPUs. You can also use the NVIDIA Volta Deep Learning AMI for NGC. P3 instances are available in the US East (Northern Virginia), US West (Oregon), EU (Ireland), and Asia Pacific (Tokyo) Regions in On-Demand, Spot, Reserved Instance, and Dedicated Host form. Today, AWS and Microsoft announced Gluon, a new open source deep learning interface which allows developers to more easily and quickly build machine learning models, without compromising performance. Gluon provides a clear, concise API for defining machine learning models using a collection of pre-built, optimized neural network components. Developers who are new to machine learning will find this interface more familiar to traditional code, since machine learning models can be defined and manipulated just like any other data structure. More seasoned data scientists and researchers will value the ability to build prototypes quickly and utilize dynamic neural network graphs for entirely new model architectures, all without sacrificing training speed. Gluon is available in Apache MXNet today, a forthcoming Microsoft Cognitive Toolkit release, and in more frameworks over time. Machine learning with neural networks (including ‘deep learning’) has three main components: data for training; a neural network model, and an algorithm which trains the neural network. You can think of the neural network in a similar way to a directed graph; it has a series of inputs (which represent the data), which connect to a series of outputs (the prediction), through a series of connected layers and weights. During training, the algorithm adjusts the weights in the network based on the error in the network output. This is the process by which the network learns; it is a memory and compute intensive process which can take days. Deep learning frameworks such as Caffe2, Cognitive Toolkit, TensorFlow, and Apache MXNet are, in part, an answer to the question ‘how can we speed this process up? Just like query optimizers in databases, the more a training engine knows about the network and the algorithm, the more optimizations it can make to the training process (for example, it can infer what needs to be re-computed on the graph based on what else has changed, and skip the unaffected weights to speed things up). These frameworks also provide parallelization to distribute the computation process, and reduce the overall training time. However, in order to achieve these optimizations, most frameworks require the developer to do some extra work: specifically, by providing a formal definition of the network graph, up-front, and then ‘freezing’ the graph, and just adjusting the weights. The network definition, which can be large and complex with millions of connections, usually has to be constructed by hand. Not only are deep learning networks unwieldy, but they can be difficult to debug and it’s hard to re-use the code between projects. The result of this complexity can be difficult for beginners and is a time-consuming task for more experienced researchers. At AWS, we’ve been experimenting with some ideas in MXNet around new, flexible, more approachable ways to define and train neural networks. Microsoft is also a contributor to the open source MXNet project, and were interested in some of these same ideas. Based on this, we got talking, and found we had a similar vision: to use these techniques to reduce the complexity of machine learning, making it accessible to more developers. 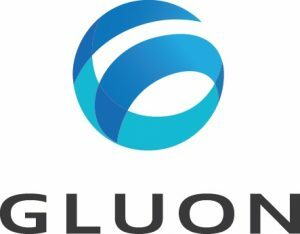 Gluon introduces four key innovations. Friendly API: Gluon networks can be defined using a simple, clear, concise code – this is easier for developers to learn, and much easier to understand than some of the more arcane and formal ways of defining networks and their associated weighted scoring functions. Dynamic networks: the network definition in Gluon is dynamic: it can bend and flex just like any other data structure. This is in contrast to the more common, formal, symbolic definition of a network which the deep learning framework has to effectively carve into stone in order to be able to effectively optimizing computation during training. Dynamic networks are easier to manage, and with Gluon, developers can easily ‘hybridize’ between these fast symbolic representations and the more friendly, dynamic ‘imperative’ definitions of the network and algorithms. The algorithm can define the network: the model and the training algorithm are brought much closer together. Instead of separate definitions, the algorithm can adjust the network dynamically during definition and training. Not only does this mean that developers can use standard programming loops, and conditionals to create these networks, but researchers can now define even more sophisticated algorithms and models which were not possible before. They are all easier to create, change, and debug. High performance operators for training: which makes it possible to have a friendly, concise API and dynamic graphs, without sacrificing training speed. This is a huge step forward in machine learning. Some frameworks bring a friendly API or dynamic graphs to deep learning, but these previous methods all incur a cost in terms of training speed. As with other areas of software, abstraction can slow down computation since it needs to be negotiated and interpreted at run time. Gluon can efficiently blend together a concise API with the formal definition under the hood, without the developer having to know about the specific details or to accommodate the compiler optimizations manually. The team here at AWS, and our collaborators at Microsoft, couldn’t be more excited to bring these improvements to developers through Gluon. We’re already seeing quite a bit of excitement from developers and researchers alike. Gluon is available today in Apache MXNet, with support coming for the Microsoft Cognitive Toolkit in a future release. We’re also publishing the front-end interface and the low-level API specifications so it can be included in other frameworks in the fullness of time. You can get started with Gluon today. Fire up the AWS Deep Learning AMI with a single click and jump into one of 50 fully worked, notebook examples. If you’re a contributor to a machine learning framework, check out the interface specs on GitHub. As a school supply aficionado, the month of September has always held a special place in my heart. Nothing sets the tone for success like getting a killer deal on pens and a crisp college ruled notebook. Even if back to school shopping trips have secured a seat in your distant memory, this is still a perfect time of year to stock up on office supplies and set aside some time for flexing those learning muscles. A great way to get started: scan through our September Tech Talks and check out the ones that pique your interest. This month we are covering re:Invent, AI, and much more. Noted below are the upcoming scheduled live, online technical sessions being held during the month of September. Make sure to register ahead of time so you won’t miss out on these free talks conducted by AWS subject matter experts. The AWS Online Tech Talks series covers a broad range of topics at varying technical levels. These sessions feature live demonstrations & customer examples led by AWS engineers and Solution Architects. Check out the AWS YouTube channel for more on-demand webinars on AWS technologies. If you are anything like me, Artificial Intelligence (AI), Machine Learning (ML), and Deep Learning are completely fascinating and exciting topics. As AI, ML, and Deep Learning become more widely used, for me it means that the science fiction written by Dr. Issac Asimov, the robotics and medical advancements in Star Wars, and the technologies that enabled Captain Kirk and his Star Trek crew “to boldly go where no man has gone before” can become achievable realities. Most people interested in the aforementioned topics are familiar with the AI and ML solutions enabled by Deep Learning, such as Convolutional Neural Networks for Image and Video Classification, Speech Recognition, Natural Language interfaces, and Recommendation Engines. However, it is not always an easy task setting up the infrastructure, environment, and tools to enable data scientists, machine learning practitioners, research scientists, and deep learning hobbyists/advocates to dive into these technologies. Most developers desire to go quickly from getting started with deep learning to training models and developing solutions using deep learning technologies. For these reasons, I would like to share some resources that will help to quickly build deep learning solutions whether you are an experienced data scientist or a curious developer wanting to get started. AWS Machine Learning Datasets: AWS hosts datasets for Machine Learning on the AWS Marketplace that you can access for free. These large datasets are available for anyone to analyze the data without requiring the data to be downloaded or stored. Predict and Extract – Learn to use pre-trained models for predictions: This hands-on tutorial will walk you through how to use pre-trained model for predicting and feature extraction using the full Imagenet dataset. Additionally, the AWS Deep Learning AMIs install preconfigured libraries for Jupyter notebooks with Python 2.7/3.4, AWS SDK for Python, and other data science related python packages and dependencies. The AMIs also come with NVIDIA CUDA and NVIDIA CUDA Deep Neural Network (cuDNN) libraries preinstalled with all the supported deep learning frameworks and the Intel Math Kernel Library is installed for Apache MXNet framework. You can launch any of the Deep Learning AMIs by visiting the AWS Marketplace using the Try the Deep Learning AMIs link. It is a great time to dive into Deep Learning. You can accelerate your work in deep learning by using the AWS Deep Learning AMIs running on the AWS cloud to get your deep learning environment running quickly or get started learning more about Deep Learning on AWS with MXNet using the AWS self-service resources. Of course, you can learn even more information about Deep Learning, Machine Learning, and Artificial Intelligence on AWS by reviewing the AWS Deep Learning page, the Amazon AI product page, and the AWS AI Blog. May the Deep Learning Force be with you all. It’s unbelievable that 2017 has flown by so quickly, yet here we are already in the month of July. A little-known fact about the 7th month of the year is that its name, July, is in honor of the Roman general, Julius Cæsar. The Roman State named the month on his behalf since it the month of his birth. Prior to this designation, the month of July was called Quintilis. I, also, thought it was interesting to learn that in the month of July, several countries celebrate their Independence Day. These countries are the United States, Bahamas, Kiribati, São Tomé, Príncipe, Liberia, Maldives, Algeria, Cape Verde, Venezuela, Burundi, Rwanda, and Somalia. Seems that the month of July was ripe for freedom and independence for all parts of the world. Therefore, there is a lot to celebrate in the month of July and you are free to add the celebration of learning to your July festivities with AWS Online Tech Talks. This month’s sessions brings you great technical information about Serverless Compute, Security and Identity, as well as, Big Data and Artificial Intelligence running on Amazon Web Services. Below is the upcoming schedule for the live, online technical sessions scheduled for the month of July. Make sure to register ahead of time so you won’t miss out on these free talks conducted by AWS subject matter experts. All schedule times for the online tech talks are shown in the Pacific Time (PDT) time zone. As the sixth month of the year, June is significant in that it is not only my birth month (very special), but it contains the summer solstice in the Northern Hemisphere, the day with the most daylight hours, and the winter solstice in the Southern Hemisphere, the day with the fewest daylight hours. In the United States, June is also the month in which we celebrate our dads with Father’s Day and have month-long celebrations of music, heritage, and the great outdoors. Therefore, the month of June can be filled with lots of excitement. So why not add even more delight to the month, by enhancing your cloud computing skills. This month’s AWS Online Tech Talks features sessions on Artificial Intelligence (AI), Storage, Big Data, and Compute among other great topics. Noted below are the upcoming scheduled live, online technical sessions being held during the month of June. Make sure to register ahead of time so you won’t miss out on these free talks conducted by AWS subject matter experts. All schedule times for the online tech talks are shown in the Pacific Time (PDT) time zone. 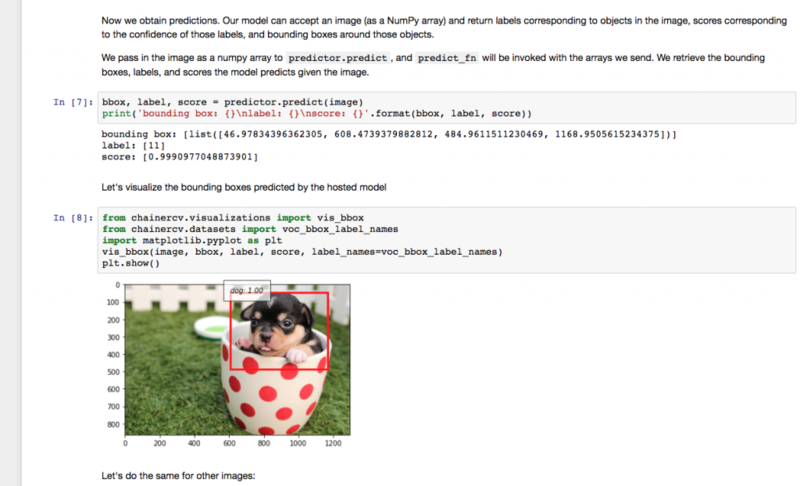 Thanks to my colleague Kiuk Chung for this great post on Deep Learning using AWS Batch. GPU instances naturally pair with deep learning as neural network algorithms can take advantage of their massive parallel processing power. AWS provides GPU instance families, such as g2 and p2, which allow customers to run scalable GPU workloads. You can leverage such scalability efficiently with AWS Batch. AWS Batch manages the underlying compute resources on-your behalf, allowing you to focus on modeling tasks without the overhead of resource management. Compute environments (that is, clusters) in AWS Batch are pools of instances in your account, which AWS Batch dynamically scales up and down, provisioning and terminating instances with respect to the numbers of jobs. This minimizes idle instances, which in turn optimizes cost. Moreover, AWS Batch ensures that submitted jobs are scheduled and placed onto the appropriate instance, hence managing the lifecycle of the jobs. With the addition of customer-provided AMIs, AWS Batch users can now take advantage of this elasticity and convenience for jobs that require GPU. This post illustrates how you can run GPU-based deep learning workloads on AWS Batch. I walk you through an example of training a convolutional neural network (the LeNet architecture), using Apache MXNet to recognize handwritten digits using the MNIST dataset. Apache MXNet is a full-featured, flexibly programmable, and highly scalable deep learning framework that supports state-of-the-art deep models, including convolutional neural networks (CNNs) and long short-term memory networks (LSTMs). Start by creating an AMI that includes the NVIDIA driver and the Amazon ECS agent. In AWS Batch, instances can be launched with the specific AMI of your choice by specifying imageId when you create your compute environment. Because you are running a job that requires GPU, you need an AMI that has the NVIDIA driver installed. As shown below, take note of the AMI value in the Outputs tab of the CloudFormation stack. You use this as the imageId value when creating the compute environment in the next section. Alternatively, you may follow the AWS Batch documentation to create a GPU-enabled AMI. A compute environment, is a collection of instances (compute resources) of the same or different instance types. In this case, you create a managed compute environment in which the instances are of type p2.xlarge. For imageId, specify the AMI you built in the previous section. Then, create a job queue. In AWS Batch, jobs are submitted to a job queue that are associated to an ordered list of compute environments. After a lower order compute environment is filled, jobs spill over to the next compute environment. For this example, you associate a single compute environment to the job queue. Finally, create a job definition, which is a template for a job specification. For those familiar with Amazon ECS, this is analogous to task definitions. You mount the directory containing the NVIDIA driver on the host to /usr/local/nvidia on the container. You also need to set the privileged flag on the container properties. The following code creates the aforementioned resources in AWS Batch. For more information, see the AWS Batch User Guide. Now you submit a job that trains a convolutional neural network model for handwritten digit recognition. Much like Amazon ECS tasks, jobs in AWS Batch are run as commands in a Docker container. To use MXNet as your deep learning library, you need a Docker image containing MXNet. For this example, use mxnet/python:gpu. The submit-job.py script submits the job, and tails the output from CloudWatch Logs. Job [train_imagenet - e1bccebc-76d9-4cd1-885b-667ef93eb1f5] is RUNNING. [2017-04-25T19:02:59.850Z] INFO:root:Saved checkpoint to "/mnt/model/mnist-0001.params"
In reality, you may want to modify the job command to save the trained model artifact to Amazon S3 so that subsequent prediction jobs can generate predictions against the model. For information about how to reference objects in Amazon S3 in your jobs, see the Creating a Simple “Fetch & Run” AWS Batch Job post. In this post, I walked you through an example of running a GPU-enabled job in AWS Batch, using MXNet as the deep learning library. AWS Batch exposes primitives to allow you to focus on implementing the most efficient algorithm for your workload. It enables you to manage the lifecycle of submitted jobs and dynamically adapt the infrastructure requirements of your jobs within the specified bounds. It’s easy to take advantage of the horizontal scalability of compute instances provided by AWS in a cost-efficient manner. MXNet, on the other hand, provides a rich set of highly optimized and scalable building blocks to start implementing your own deep learning algorithms. Together, you can not only solve problems requiring large neural network models, but also cut down on iteration time by harnessing the seemingly unlimited compute resources in Amazon EC2. With AWS Batch managing the resources on your behalf, you can easily implement workloads such as hyper-parameter optimization to fan out tens or even hundreds of searches in parallel to find the best set of model parameters for your problem space. Moreover, because your jobs are run inside Docker containers, you may choose the tools and libraries that best fit your needs, build a Docker image, and submit your jobs using the image of your choice. We encourage you to try it yourself and let us know what you think! My colleague Mia Champion is a scientist (check out her publications), an AWS Certified Solutions Architect, and an AWS Certified Developer. The time that she spent doing research on large-data datasets gave her an appreciation for the value of cloud computing in the bioinformatics space, which she summarizes and explains in the guest post below! Technological advances in scientific research continue to enable the collection of exponentially growing datasets that are also increasing in the complexity of their content. The global pace of innovation is now also fueled by the recent cloud-computing revolution, which provides researchers with a seemingly boundless scalable and agile infrastructure. Now, researchers can remove the hindrances of having to own and maintain their own sequencers, microscopes, compute clusters, and more. Using the cloud, scientists can easily store, manage, process and share datasets for millions of patient samples with gigabytes and more of data for each individual. As American physicist, John Bardeen once said: “Science is a collaborative effort. The combined results of several people working together is much more effective than could be that of an individual scientist working alone”. Today, we have many individual researchers and organizations leveraging secure cloud enabled data sharing on an unprecedented scale and producing innovative, customized analytical solutions using the AWS cloud. But, can secure data sharing and analytics be done on such a collaborative scale as to revolutionize the way science is done across a domain of interest or even across discipline/s of science? Can building a cloud-enabled consortium of resources remove the analytical variability that leads to diminished reproducibility, which has long plagued the interpretability and impact of research discoveries? The answers to these questions are ‘yes’ and initiatives such as the Neuro Cloud Consortium, The Global Alliance for Genomics and Health (GA4GH), and The Sage Bionetworks Synapse platform, which powers many research consortiums including the DREAM challenges, are starting to put into practice model cloud-initiatives that will not only provide impactful discoveries in the areas of neuroscience, infectious disease, and cancer, but are also revolutionizing the way in which scientific research is done. This method of collaboration is problematic for many reasons. The first concern is data security, since dataset download essentially permits “chain-data-sharing” with any number of recipients. Second, analytics done using compute environments that are not templated at some level introduces the risk of variable analytics that itself is not reproducible by a different investigator, or even the same investigator using a different compute environment. Third, the required data dump, processing, and then re-upload or distribution to the collaborative group is highly inefficient and dependent upon each individual’s networking and compute capabilities. Overall, traditional methods of scientific collaboration have introduced methods in which security is compromised and time to discovery is hampered. Docker container images have all of the application’s dependencies bundled together, and therefore provide a high degree of versatility and portability, which is a significant advantage over using other executable-based approaches. In the case of collaborative machine learning projects, each docker container will contain applications, language runtime, packages and libraries, as well as any of the more popular deep learning frameworks commonly used by researchers including: MXNet, Caffe, TensorFlow, and Theano. A common feature in these frameworks is the ability to leverage a host machine’s Graphical Processing Units (GPUs) for significant acceleration of the matrix and vector operations involved in the machine learning computations. As such, researchers with these objectives can leverage EC2’s new P2 instance types in order to power execution of submitted machine learning models. In addition, GPUs can be mounted directly to containers using the NVIDIA Docker tool and appear at the system level as additional devices. 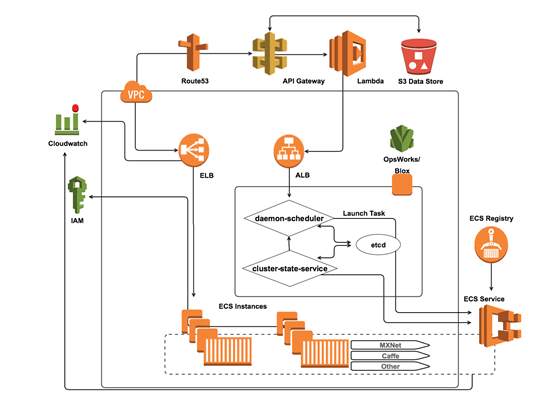 By leveraging Amazon EC2 Container Service and the EC2 Container Registry, collaborators are able to execute analytical solutions submitted to the project repository by their colleagues in a reproducible fashion as well as continue to build on their existing environment. Researchers can also architect a continuous deployment pipeline to run their docker-enabled workflows. In conclusion, emerging cloud-enabled consortium initiatives serve as models for the broader research community for how cloud-enabled community science can expedite discoveries in Precision Medicine while also providing a platform where data security and discovery reproducibility is inherent to the project execution. — Mia D. Champion, Ph.D.
Unbelievably it is March already, as you enter into the madness of March don’t forget to take some time and learning more about the latest service innovations from AWS. Each month, we have a series of webinars targeting best practices and new service features in the AWS Cloud. I have shared below the schedule for the live, online technical sessions scheduled for the month of March. Remember these talks are free, but they fill up quickly so register ahead of time. The online tech talks scheduled times are shown in Pacific Time (PT) time zone. The AWS Online Tech Talks series covers a broad range of topics at varying technical levels. These technical sessions are led by AWS solutions architects and engineers and feature live demonstrations & customer examples. You can also check out the AWS on-demand webinar series on the AWS YouTube channel. We’re back in San Jose for the Strata conference, March 13-16, 2017, to talk all things big data at AWS and show you some of our latest innovations. Come meet the AWS Big Data team at booth #928, where big data experts will be happy to answer your questions, hear about your requirements, and help you with your big data initiatives. New this year, we’re hosting a hands-on tutorial on Tuesday, where big data solutions architects will guide you through creating a sample big data application using services such as Amazon Kinesis, Amazon Athena, and AWS Lambda. You can catch the tutorial on Tuesday March 14, 9am – 12:30pm. Please note that you may need to register in advance. As previous years, Strata will host a number of technical sessions where you can get best practices and learn more about big data on AWS. Here are some recommendations to get you started. Going real time: Creating online datasets for personalization. Looking forward to seeing you at Strata + Hadoop World! Excited about MXNet joining Apache! From Alexa to Amazon Go, we use deep learning extensively across all areas of Amazon, and we’ve tried a lot of deep learning engines along the way. One has emerged as the most scalable, efficient way to perform deep learning, and for these reasons, we have selected MXNet as our engine of choice at Amazon. MXNet is an open source, state of the art deep learning engine, which allows developers to build sophisticated, custom artificial intelligence systems. Training these systems is significantly faster in MXNet, due to its scale and performance. For example, for the popular image recognition network, Resnet, MXNet has 2X the throughput compared to other engines, letting you train equivalent models in half the time. MXNet also shows close to linear scaling across hundreds of GPUs, while the performance of other engines show diminishing returns at scale. We have a significant team at Amazon working with the MXNet community to continue to evolve it. The team proposed MXNet joining the Apache Incubator to take advantage of the Apache Software Foundation’s process, stewardship, outreach, and community events. We’re excited to announce that it has been accepted. We’re at the start what we’ll be investing in Apache MXNet, and look forward to partnering with the community to keep extending its already significant utility. If you’d like to get started with MXNet, take a look at the keynote presentation I gave at AWS Re:Invent, and fire up an instance (or an entire cluster), of the AWS Deep Learning AMI which includes MXNet with example code, pre-compiled and ready to rock. You should also watch Leo’s presentation and tutorial on recommendation modeling. You should follow @apachemxnet on Twitter, or check out the new Apache MXNet page for updates from the open source project. Three weeks ago, Amazon Web Services ran their annual love-fest in Las Vegas and it was quite a remarkable week. On arrival, attendees (all 32,000+ of them) were given a shiny new Alexa Echo Dot, Amazon’s latest entrant into the growing market for voice controlled, AI-based smart assistants, a segment that includes Apple’s Siri, Google Assistant and Microsoft’s Cortana. Amazon have now made it clear that they’re taking Artificial Intelligence (AI) and Machine Learning very seriously, with four brand new, developer-focussed AI related services (Polly, Rekognition, Lex and MXNet) announced during the week. The free Alexa Echo Dots yet another incentive for developers to start building apps that make use of (and ultimately contribute to) Amazon’s efforts in this space. While the potential of artificial intelligence and machine learning technologies are both exciting and somewhat scary, there was plenty more to consider over the course of the week with a bevy of announcements such as new server instance types, enhanced support and orchestration for containers (Blox), low cost, simple to launch virtual servers from $5 per month (Lightsail), free of charge DDoS protection (AWS Shield), application performance monitoring and debugging (X-Ray), a new ”Internet of Things” (IoT) play to help developers build and manage smart, connected devices (Greengrass) and a fully managed continuous integration (CI) service (CodeBuild) that neatly rounds off Amazon’s DevOps-friendly suite of CI/CD services — and that’s just scratching the surface. 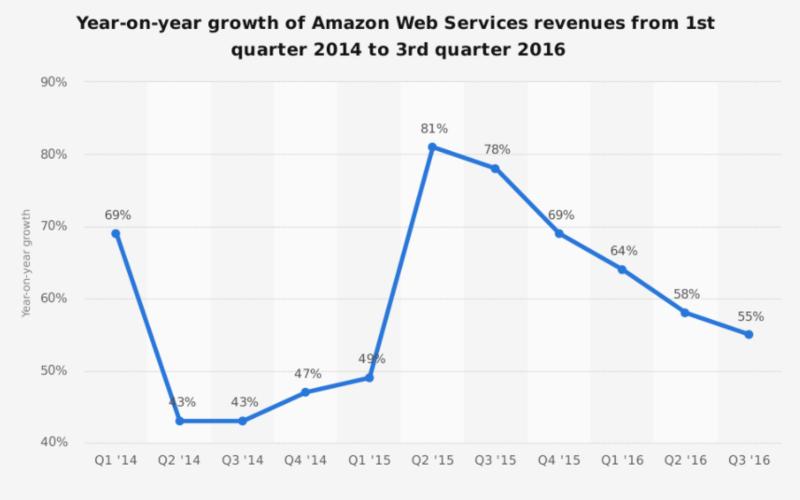 For me, the main takeaway was that the pace of technology-enabled change is continuing to accelerate and Amazon Web Services is very likely to be at the heart of it. 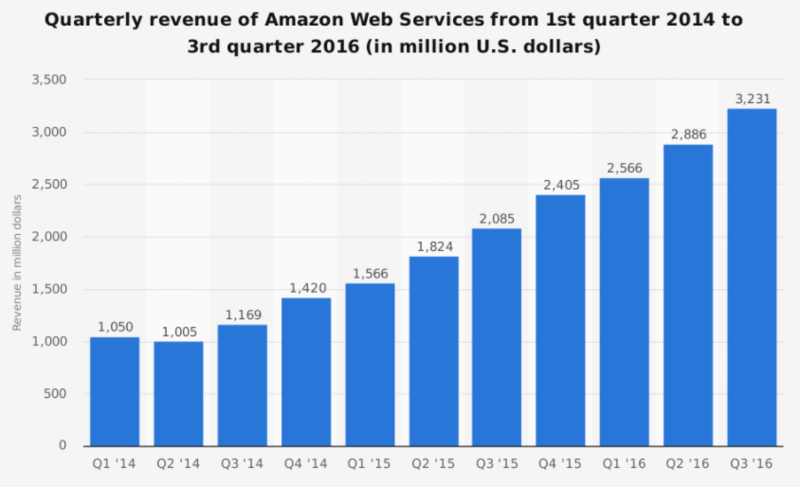 AWS is a sales and innovation machine, continuing to put distance between themselves and their competitors — their sheer pace of innovation would appear almost impossible to compete with. The public clouds of Microsoft, IBM and Google would need years to catch up and that’s assuming AWS were sporting enough to stand still for that long. 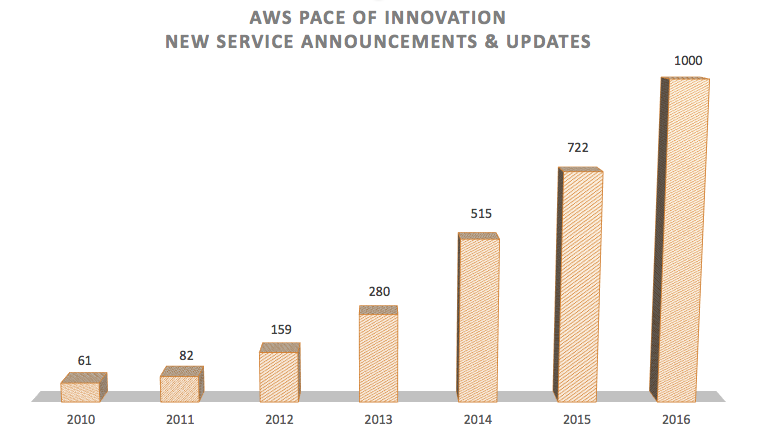 In 2016, AWS announced around 1000 new services and updates — simply incredible if you’re company whose product and development teams are making use of the platform, and quite simply terrifying if you’re just about anyone else. As AWS continue their march up the value chain, those in the business of infrastructure services, monitoring, BI, data analytics, CI/CD developer tools, network security and even artificial intelligence (AI) all have very good reason to be concerned. Interestingly, AWS reported an annual revenue run rate of nearly $13 billion with an incredible growth rate of 55% this past year, while the traditional big IT vendors — VMware, HP, Oracle, Cisco, Dell, EMC and IBM have gone backwards — dropping from a collective $221 billion revenue in 2012, to $206 billion in 2016. Momentum for the public cloud keeps growing, and it’s easy to see why. AWS is without doubt the leader in the field, and according to Andy Jassy (AWS CEO and pleasingly the very same guy who first presented Jeff Bezos with the AWS business plan) they are the fastest growing, US$1 billion-plus technology company ever, with Gartner estimating in 2015 that AWS is more than ten times the size of the next 14 competitors in the public cloud space combined — Microsoft, Google and IBM included. If you’re an application developer looking to win in your market, you would be remiss not to give careful consideration to building your application on top of AWS. Legacy IT infrastructure still has its place, but if your business is looking to the future then the cloud with all its automation and as-a-service goodness is where it’s at. AWS’ API-driven infrastructure services enable you to take your development processes and application smarts to the next level. Adopting continuous delivery allows your product and development teams to move many orders of magnitude faster than they do today, reducing outages, improving software quality and security. And once your applications are infrastructure aware (aka “cloud native”), they’ll auto-scale seamlessly with the peaks and troughs of customer demand, self-heal when things go wrong and deliver a a great experience to your customers — no matter where they are in the world. If you’re serious about embiggening your business, you need to embiggen your product and software development capabilities, and you need to do it quickly. Wondering where you’ll get the biggest bang for your buck? Where you’ll find the most efficiency gains? 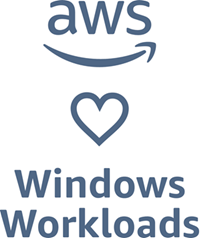 AWS looks like a pretty safe bet to me. The post AWS Reinvent 2016: Embiggen your business with Amazon Web Services appeared first on AWS Managed Services by Anchor.